Online Pilates Exercise Workouts: Get Started Right Now! If you are looking for an Online Pilates Exercise workout that is out of the ordinary you have come to the right place. Pilates workouts aren’t just for elite Hollywood stars and gym-goers with a lot of money to spend on private lessons. Pilates is for ordinary people who want to look and feel great. This online workout is for people who want to keep their back and joints healthy while trimming up the waist. You can do a Pilates workout right in the comfort of your own home, in a hotel room, at your mother-in-law’s, or anywhere else you choose. The newly revised Pilates ebook includes the classics and fundamentals of Pilates moves with detailed descriptions and pictures that are easy for you to read and follow. It also comes with variations and modifications for a healthy back and joints. 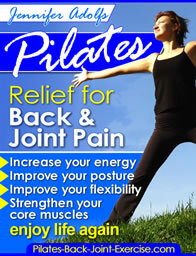 The Pilates ebook lists modifications for those with spine and other musculoskeletal conditions. This workout will teach you the fundamental movements of Pilates. Learning the fundamentals of Pilates first will help carry you into the more advanced movements with ease and precision. The fundamental movements will teach you how to lift your head without straining your neck. You will learn how to articulate the spine, to peel the vertebrae making you feel taller and more energized. Check out this online free Pilates exercise move the Bridge, as a great beginner warmup exercise. You’ll learn how to stabilize the scapula or shoulder blades without tensing the neck and shoulders, and how to stabilize the pelvis for better lower extremity control. Stabilizing the pelvis using the deep pelvic floor muscles acts to relax the very active gluteal muscles that tense and cause pain in the sacrum and hips including sciatica. Click here to buy Pilates for Healthy Back and Joints MP4 Version. This workout in the Online Pilates Exercise ebook is for people who have mastered the beginner level exercises and can now further challenge themselves with new variations and movements equal to or a bit above their abilities. The variations are exercises that add to a level of challenge to a particular exercise. For instance once you are able to stabilize your body and pelvis in a bridge you can then begin to move the legs or arms. This is the final of the three workouts in the Pilates Ebook available here. This routine is for people who have completed the other 2 workout sequences with control, precision, concentration, and no pain. Once you come to this point the exercises are designed with even more variations that work the extremities (arms and legs) to their full range of motion. See an advanced Pilates exercise picture and detailed description here. Another challenge to this advanced workout is adding movements that incorporate more twisting motions, which takes a great deal of body control to avoid injuring the spine. All of the above workouts give cautions for specific musculoskeletal conditions such as osteoporosis, stenosis, and other degenerative spine and joint diseases. The Pilates ebook available here will get you started with three progressive online Pilates exercise workouts. These workouts can be printed out right from your computer when you order here today along with your free Pilates exercise online bonus ebook.